NBA Commissioner Adam Silver has made two decisions this week: one courageous, and one craven. These are two decisions that seem like they should be coming from diametrically different people. Instead, they are coming from the same mouth. The two decisions, however, tell us a great deal about a commissioner who is a canny political operator. They are also instructive about the current balance of forces in two central movements for social justice. The more high-profile decision Silver made was his call to move the 2017 All-Star Game from Charlotte, North Carolina, because of the state’s draconian “bathroom bill” that prohibits local municipalities from passing ordinances to protect the rights of lesbian, gay, bisexual, and transgender people. People can read the full statement from Silver here. It absolutely should be celebrated that Silver stood by the league’s “principles of diversity and inclusion” and chose to actually risk a backlash over these principles. I wrote in March about why it was critical for Silver to not let pass this opportunity to actually stand for something. The second decision, arriving with far less publicity, was the one to fine players in the WNBA for wearing shirts against both police violence and violence against the police. These shirts were emblazoned with the names Alton Sterling and Philando Castile, in addition to a Dallas badge. They also read #BlackLivesMatter and #Dallas5. When the league sent out a memo warning players to not wear political slogans, the New York Liberty, Phoenix Mercury, and Indiana Fever switched to wearing just plain black T-shirts with nothing but an Adidas logo. Now all three of these teams have been fined $5,000, and the players who wore the plain black shirts were fined $500 each. That $500 might not sound like a lot for a pro athlete, but when the average salary is $72,000, it has some bite. Today, I decided to not be silent in the wake of the @wnba fines against @nyliberty, @indianafever & @phoenixmercury due to our support in the#BlackLivesMatter movement . Seventy percent of the @wnba players are African-American women and as a league collectively impacted. My teammates and I will continue to use our platform and raise awareness for the #BlackLivesMatter movement until the @wnba gives its support as it does for Breast Cancer Awareness, Pride and other subject matters. After the game, Liberty players Charles, Swin Cash, and Tanisha Wright spoke to the press. People should read their stirring statements, transcribed by Deadspin here. So Adam Silver can use the NBA All-Star Game as a place to make the political views of the league known, but players can’t use their pregame warm-ups to speak to an issue that intimately affects their lives? On paper, this looks like a breathtaking double standard, or at least a confused contradiction. But it makes sense if you understand that standing up to this North Carolina law isn’t just the right thing to do. It’s smart for a league that wants to market itself as young, LGBT friendly, and willing to stand up for those being demonized by the state’s execrable governor, Pat McCrory. The NBA is now costing the state of North Carolina tens of millions of dollars by pulling the game. But its own risk is minimal. To stand with #BlackLivesMatter and to sanction the use of the court as a political space, holds a great deal more risk. You risk alienating white fans. 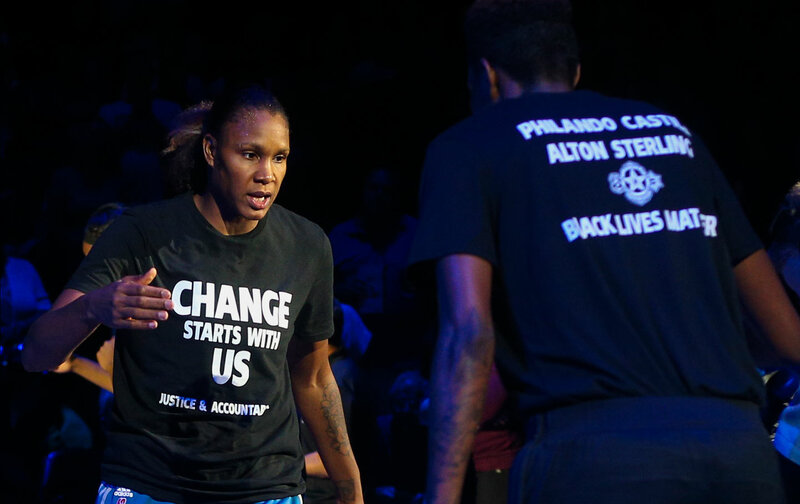 You risk police walkouts, which took place in Minnesota when off-duty police hired as WNBA security walked out of the arena when they saw shirts that said #BlackLivesMatter. But for Silver, these aren’t the only risks. To hand over political ownership of the court to players means that the league cannot control its carefully crafted image. The most important media message is what takes place on those 94 feet of hardwood, and the league will never surrender that space without a fight. But by cracking down, Silver has invited a different kind of risk: the risk that his every dictate will not be meekly accepted and that this fight for the court will now be joined. I am sure Adam Silver and NFL Commissioner Roger Goodell will note Carmelo’s response and realize the following: If they crack down on athletes who stand with #BlackLivesMatter, don’t expect compliance. Expect defiance.